If you had the chance to visit Bruges but knew you could only be there for about 3 hours, would you still go? I hope the answer to that is yes, because that is exactly what we did. We recently spent a week at Duinrell Holiday Park in Holland, and when planning our route for the drive from Calais I noticed we would be driving right by Bruges, it wasn't even a detour, we would be going right past it. Now I visited Bruges with my family as a teen, but my overriding memory from that trip was that a bird did it's "business" on my head. So I felt like I really needed to give Bruges a chance to redeem itself, plus it's Belgium and I never need convincing when there's chocolate involved. 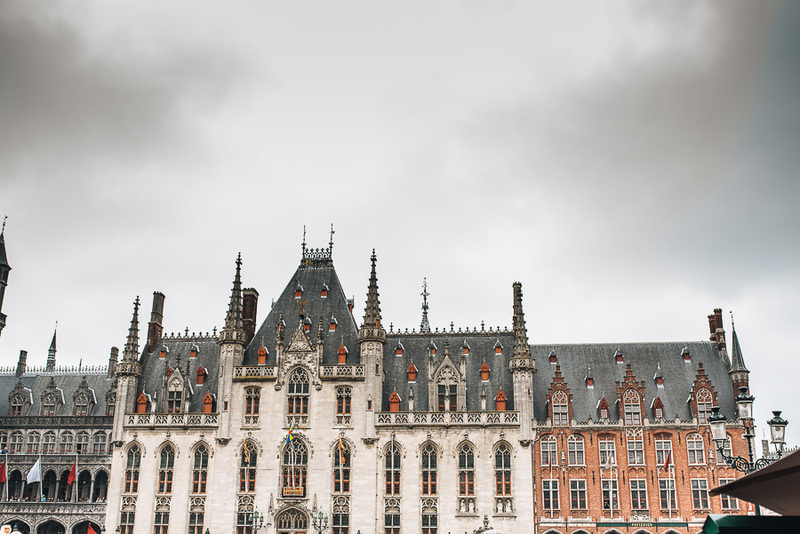 The visit Bruges website was really helpful, and I was able to pinpoint a few key sights I felt we would enjoy seeing the most, and I was also able to find a car park that was within walking distance of these places. Now I don't want to be a bore and witter on about car parks, but seriously it needs a minute of your time, because I want all car parks everywhere to be like Bruges car parks, ok? It was an underground car park not too dissimilar to ones in the UK, but every parking space was angled slightly making driving into each space, regardless how close to a wall it was, a breeze. But most importantly every space had a little light above it, that was either red or green, depending on whether the space was free or not. So no driving down a lane just to see if there might be a space, you could see from the end of the row if there were any free. So simple, but so genius. And then we just hopped in an elevator, a little unsure where we would come out, as we had just driven into the car park from a busy main road, but we ended up in a little glass building right in the heart of the city centre, with no signs of traffic anywhere. If we hadn't just come up from the car park I would have never known it was there. It made accessing Bruges so easy, when a lot of cities tend to make it difficult for you to visit by car. So if you ever driving by, pop "Parking T'Zand" into your google maps and you'll be enjoying all the delights of Bruges in no time. I had read that "The Markt" was a good place to see, so we got some directions, and in no time at all, there it was, a beautiful town square, bustling with tourists, and with such beautiful architecutre too. I also knew I wanted to see the river, so we headed towards some water on the map, and lo and behold that famous Bruges scene of the willow on the water was right before us, and was as pretty as you'd hope it would be. We spent the rest of our short time there wandering through the beautiful streets and admiring all of the beautiful architecture. As soon as we spotted a pretty looking chocolatier we popped in and stocked up on some Belgium chocolates, which did not disappoint! We were there at around midday, and so treated ourselves to some delicious panini's from a bakery for lunch. And then later in the afternoon when the children were hungry once again, we found a lovely little cafe that served waffles, genuine Belgium waffles drizzled in melted chocolate. Delicious seems like an understatement. Despite only spending a few hours in Bruges we fell in love with this city a little bit, and it has definitely secured a spot on our list of "child-free city breaks we must take." So whether you are driving through or planning a trip to this delighful city, I've no doubt you will have a wonderful time.